C is a programming language for general purpose, structured, imperative, procedural, low-level, standardized, created in 1972 by Dennis Ritchie at Bell Labs, for use in the UNIX operating system. Since then it has spread to too many other operating systems and has become one of the most commonly used programming languages. 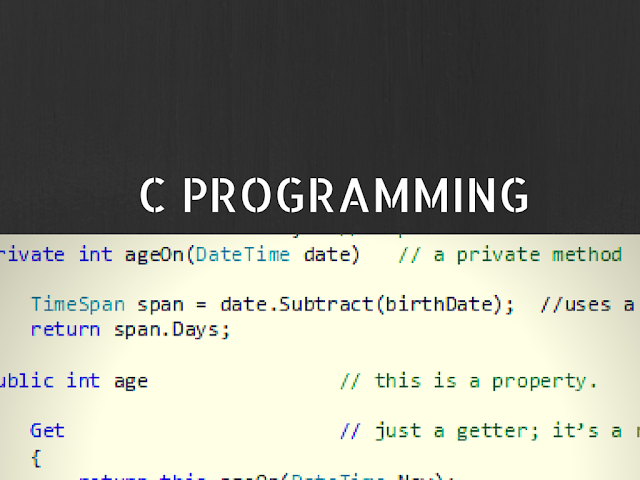 C programming language has the strength, its efficiency, and is the preferred programming language for developing systems and base software, although it is also used to develop computer programs. It is also widely used in the teaching of computer science; it has not been designed for students and presents some difficulties in its use for teaching. Another important characteristic of C is its proximity to the machine code, which enables a designer; it is able to make some predictions of how the software will behave, when executed. Definitely there is no one single best way to learn the C programming language instead it depends on the type of person a learner is. In this article we will just go through some of the best ways of learning and working on C programming language according to the type of learners. In addition to learning the code, that's obvious, you'll need another program that can understand this code and translate it into a format that the computer understands, i.e., machine code. Those programs that do this are called compilers. For further knowledge you may need to learn the basic of compilers and algorithm sections. There are several compilers, where its function is to generate machine code that is stored in an executable (EXE) file. For those who are new, there are more didactic compilers like DEV-C, which is a great platform and also it is free. For those who already have a little more intimacy with this language and with the environment of compilers, the Turbo-C may be the most suitable platform. Once you are in the process of learning it becomes pretty easy to navigate the required resources for learning this language. Its important to start with simple programming and not worry about advanced features. Learning to program require patience and practice. Therefore try to keep smaller achievable goals during your learning. Take small steps before jumping into your fancy big program. Building a simple program in C language involves four essential steps. Code writing: writing actually the code also setting it. This is the most important area where you spend most time. Make small programs and build onto it gradually. If you are self-taught (he who learns only by studying at home) or is out of time, money or willingness to take a course in programming, the most suitable way out is through books. The books indicate that we are complete, have hundreds of pages of explanation ready codes, proposed and solved exercises. C Programming Books can be used by everyone, it is not necessary to know programming to use the books that we indicate. Read the descriptions of the books, and choose the one that best fits your profile. Obviously, studying the two will make you a far more professional and complete programmer. This is the book of the famous series “Head First” are fully focused books for the lay man. It is virtually impossible not to learn from this book. In the first few pages it ever teaches you what you need to install and what to do to create your first projects in C, it's just amazing. It has a lot of pictures, screenshots and codes, all well explained. This book series is known for its 'good mood' as it has an extremely pleasant and easy to read and understandable text. If you want something simple to understand without much complexity and technical details, do not hesitate to use this book. Below is the best c book programming book for people who love to get deeper into concept c programming and its features. If you are of those “bits hunters” who want to understand how everything works, know every detail of a programming language and really master it, I recommend the book ‘C How to Program Deitel’. It is also a collection of books, and in our view, is the most comprehensive book available on the market on the C language. It has a lot of codea, all extremely well commented, line by line; you absolutely understand everything in each program. It is a book that also assumes that you are beginner, and have never had contact with any other language, so it is also widely used by beginners. But the uniqueness of this book is that this is much more complete and goes beyond and is for those who like to read. Surely, by studying this book you will understand well the concepts of the C language, and at the end you will be already able to create amazing programs. Learning a programming language is something that is done even by hobby, something to interest even. Learning C becomes much more interesting because of the ease with which you can make applications for Windows. We recommend you to take a formal college course in c programming instead of looking for c programming certification. This is mainly due to lack of any reasonable authority providing certification in c programming. Though there are other derived languages from C that are offered through various sources. Do not waste your money in getting certified for C programming. Instead spend time on making some good programs and learn the fundamentals of the language. C# is a different programming language than C. Therefore ensure you understand what you are trying to do. C# is a programming language that is used on Microsoft only platform. Microsoft also offers a certification for c#. It's not hard to see people who after a few weeks of study are already creating its first applications with 'C sharp', with graphic interface, buttons, menus and all that we touch daily. However, rather than only learning it is better to learn and make it a profession. The importance of C# in the programming market is so big that we do not speak; only we'll let you notice: That companies use Windows? How many applications in Pharmacy, Shops, and Supermarkets use Windows? How many systems are meant to be used on Windows? So if you want to work in the business, you may opt for an excellent course with C# certificate. There you will have c PDF tutorials, audio files, video lessons, exercises, tests and everything to become a certified professional to work with C language and Windows Forms Applications. Few people know, but Microsoft gives an amazing support for people who want to learn how to use their products, including 'their' languages, such as C programming language. Obviously, do not expect a full super material, with teaching, examples, exercises and free on the Internet solutions, it is very rare to have quality material completely available on the network. So if you really want to learn and take seriously their learning in C, It is recommended that you use books. On the Microsoft website, they offer a portal dedicated exclusively to learning various tools, including C programming language and Visual Studio. Being a program language it is obvious that the C is dynamic and so is the programs build using it. So it is essential for the programmers and learners to keep on learning and reviewing the new changes in the programming with the help of books and experts. There are also some open and free forums available online to ask questions regarding programming. It is also suggested for learners to clear their difficulties and confusions for C language through those forums. I am a Sr. Research Writer in a UK based company named as DissertationBoost - Dissertation Writing Service. My passion is to write a quality content on different topics. My aim is to provide technical knowledge to public.